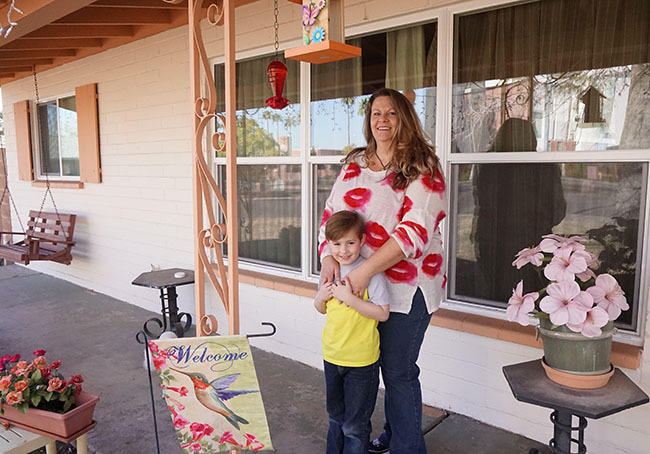 Patricia Brazil and her daughter Michelle had lived together in a house on Camelback Road for 45 years, from the day mother brought daughter home from the hospital as a newborn. Their aging home needed a paint job and new windows to improve its insulation from summer’s sear and winter’s chill and to block noisy street traffic. Nathaniel Brazil and his mom, Michelle, have a front-porch view of GCU’s campus from their home on Camelback Road. They are among 43 families who in 2015 received help through GCU’s partnership with Habitat for Humanity. So it was nothing short of a blessing when, in the fall of 2014, a team from Habitat for Humanity and Grand Canyon University dropped by the Brazils’ home to discuss a new neighborhood revitalization program that would assist homeowners in gussying up their property. The women loved meeting the friendly, purple T-shirted students who attended classes right across the street and decided right then to take advantage of the offer of help. They would use their income tax refund to pay their share of the project and pitch in on the sweat equity, too. Patricia, who died two months later, never got to see the shiny new windows or the warm sandstone paint her daughter chose. But Michelle, who lives in the three-bedroom house with her 6-year-old son, Nathaniel, feels that her mother would approve. “I hope she’s looking down and thinking that I made good choices,” she said, looking around her big front yard punctuated by flower pots, a wind chime, a hummingbird feeder and an inviting front-porch swing. The Brazils are among 43 families in the Canyon Corridor south of GCU and around the new Grand Canyon University Golf Course in Maryvale who in 2015 benefitted from the University’s unique partnership with Habitat for Humanity Central Arizona. The homeowners provide partial financing and sweat equity on home repairs, painting, landscaping and more. The goal of the four-phase initiative, part of GCU President Brian Mueller’s neighborhood revitalization plan that was launched in January 2015, is to upgrade as many as 700 homes. “This partnership with Habitat for Humanity is part of a larger mission — along with our public schools initiative, our safety initiative and our jobs initiative — to really make a difference in this neighborhood,” Mueller said. “Home values are up 30 percent, crime rates are down 30 percent, public school rankings are improving and jobs are more prevalent for the people who live in this community. “As the fastest-growing employer in the city, GCU will serve as a hub that is going to make this one of the most desirable neighborhoods to move into and invest in,” he said. 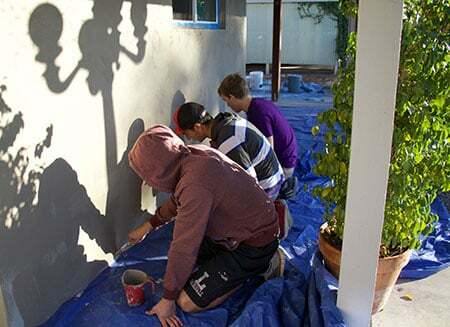 Last year, 584 GCU student and staff volunteers contributed nearly 4,000 hours to the Habitat projects, which involved painting, landscaping, roof repairs and other work on the homes’ exteriors. 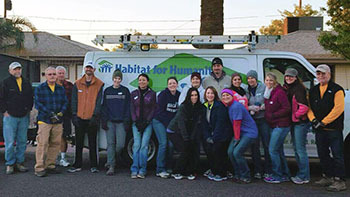 It also spawned a unique program by which GCU employees can use their state tax dollars to support Habitat. In 2015, Habitat received nearly $313,000 from GCU and its employees, who contributed through Donate to Elevate, a program that allows them to direct their state tax-credit money to Habitat with no effect on their take-home pay. So far in 2016, employees have pledged $367,000 to Habitat through Donate to Elevate, and the work area is being expanded to neighborhoods north of campus from Interstate 17 to 35th Avenue. Additionally, GCU is now an official campus chapter of Habitat, which means students will be involved in every step of neighborhood improvement, from training and outreach to the actual work and follow-up to it, said Chris Cunningham, GCU’s Local Outreach coordinator. “Students will now have the opportunity to take part in advocating for low-income housing, which is a huge need nationwide and in our neighborhood specifically,” Cunningham said. GCU students say they love the feeling they get from helping with Habitat projects. Senior Brandon Johnson first participated in a Habitat project during last fall’s Serve the City event, in which the Brazils’ home was included. Johnson immediately was sold on the uplifting music, a GCU trademark, the contagious enthusiasm of students and the fact that it was a volunteer opportunity within walking distance from campus. Junior sociology major Taylor Williams also jumped into Habitat with both feet last fall, painting and hauling rocks for a landscaping project. Williams quotes James 2:26 when asked why he volunteers. Williams said he hopes GCU’s neighbors see that the students, instead of going out to party the night before, got up early to reflect Jesus’ love for us. “We are loving our neighborhood like He loved us,” he said. GCU staff has been stepping up, too, signing up as teams from individual departments and taking advantage of GCU’s Community Service Policy by volunteering on Fridays. Through July, seven Habitat projects have been scheduled on select Friday and Saturday mornings, said Debbie Accomazzo, the University’s community outreach manager. Individuals are plugged into the schedule when possible, but the trend, both at GCU and around the country, seems to be teams, Accomazzo said. Dr. Laura Terry and 12 other faculty members in the psychology department of the College of Humanities and Social Sciences together moved 17 tons of gravel, after digging out grass and laying down black plastic, on one chilly morning in December. Habitat made it easy, too, she noted, in that all of the equipment and the instructions for using it were provided to the faculty members. Barlow said he’s never seen such motivation and enthusiasm as has been exhibited by GCU, its faculty, staff and students. “This model is something that could be shared all over the place,” he said. Brazil, who grew up in the neighborhood riding her bike to Cielito Park down the street and crossing a sleepy Camelback Road to hit golf balls on GCU’s grassy fields, said it’s obvious that the area has declined over the years. But now that the college kids in purple are pitching in and their University is here to stay, there’s nothing the neighborhood can’t become, she said. “It’s nice to have some kind of change,” she said. Students who are interested in being a part of Habitat may email chris.cunningham@gcu.edu or Brandon.johnson@gcu.edu. GCU departments may email debbie.accomazzo@gcu.edu.